Happy August! It’s been a roller coaster of ride 2017. A few highs and lows. 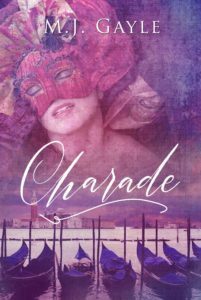 I’ll elaborate further at the end of the year with my “2017 Year End Musings.” As for now, I have updated the cover for M.J. Gayle’s erotica book Charade. I have to admit that it’s gorgeous! I love the purple tone and mysterious eroticism of the photo. The cover designer encapsulated the essence of Venice on the print cover. The image transports me back to my visit to the mystical city as well as what I envisioned when I wrote Charade. Check out the full cover on Amazon (print version). So, if you haven’t purchased the print version yet, please do so and while on Amazon, I’d be honored and pleased if you’d take a few minutes to leave a review!